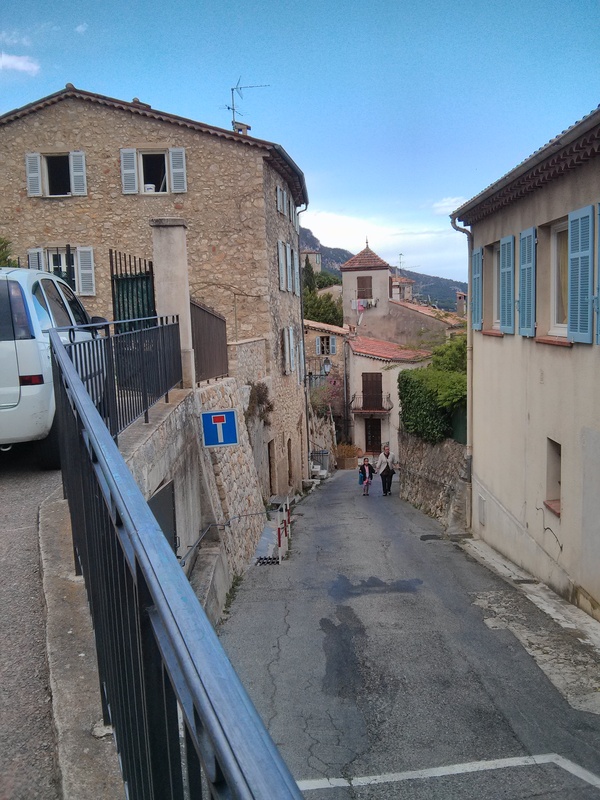 The past few days in Provence can only be described as delicious……………delicious scenery, delicious food, delicious smells from roses, lavender, orange blossoms, jasmine and the burning leaves. That is an awesome memory smell for me – burning leaves and branches from the olive trees – for me that is the smell of Palestine and it evokes some of the best life memories. The sun is so bright and the past few days the sky has often been cloudless. 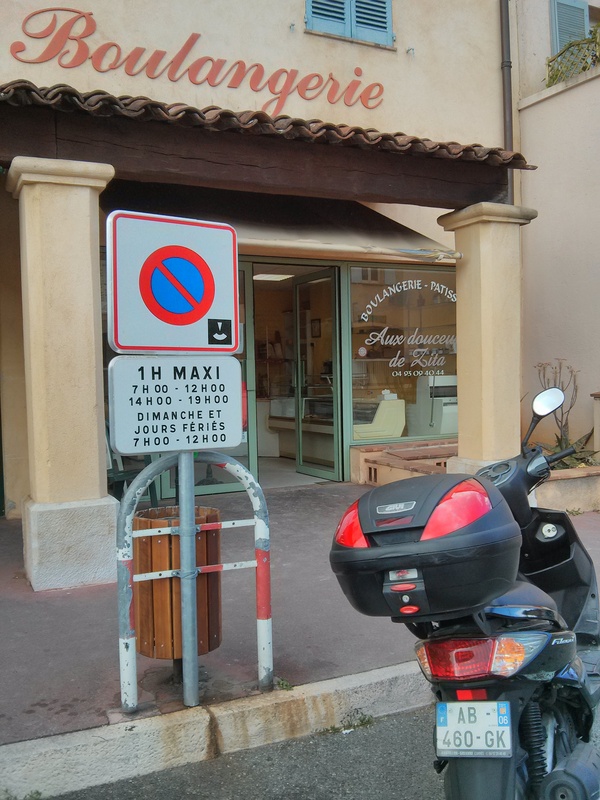 We visited a huge Friday market in Valbonne where they sell clothing (mostly Italian), soaps, pottery, linens, herbs and some vegetables and fruits. I bought an Arnica cream(Baume a l’Arnica pour les Articulations Douloureauses) that is effective on aches and pains – great for my creaky knee. 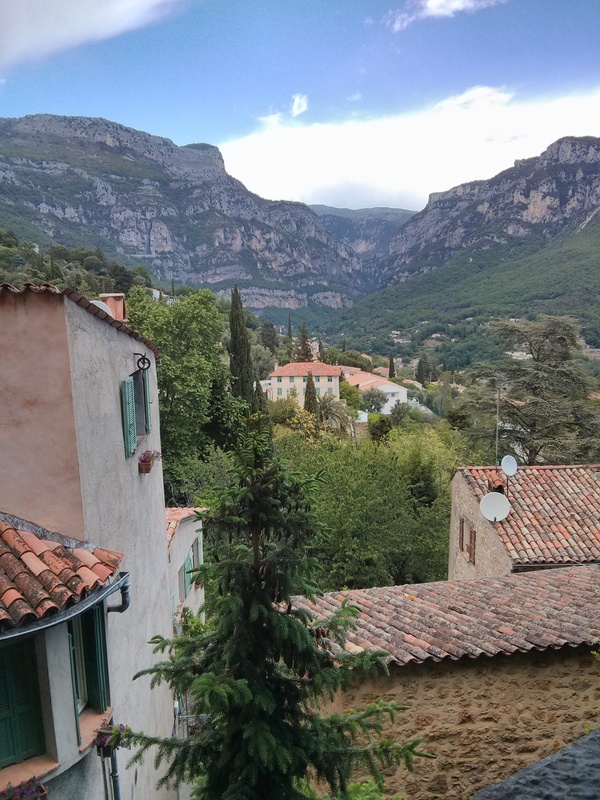 I also bought some lavender soap and some mountain honey (Miel de Montagne). Greta is an awesome tour guide and has made sure that I get to see everything. She has taken amazing care of me. Hmmmm…..how can I possibly say thank you enough?!?!?!? 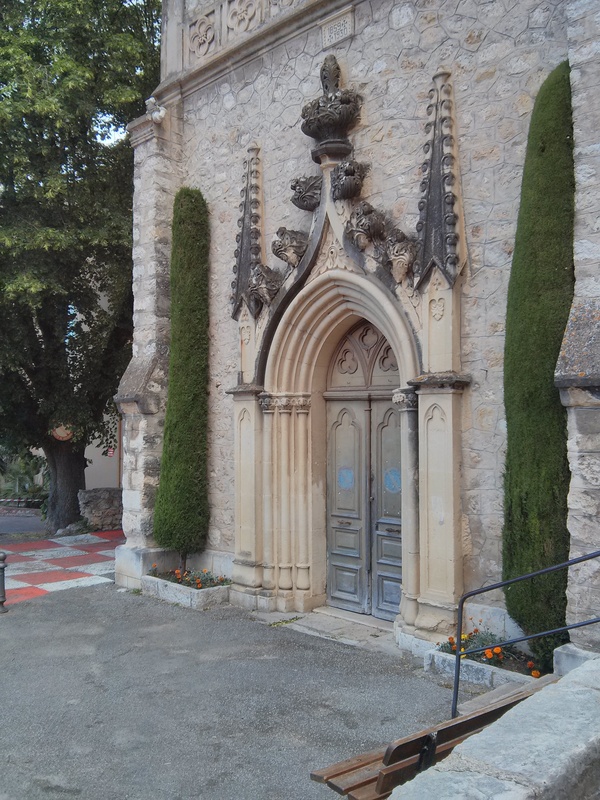 I took a leisurely walk through the village of Bar Sur Loup – there is not much there but it is just so picturesque. Today we had lunch at a neighbour’s home. This villa is exquisite and I could not do it justice with my words but it was exactly how I would imagine my dream home………pictures of ships and beach scenes, African art and furniture, beachy, breezy, and comfortable. 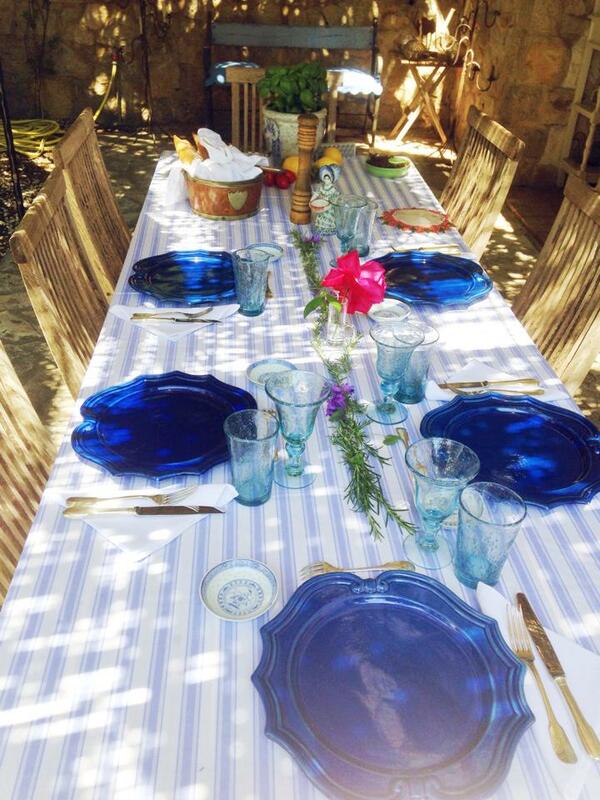 The table set outside was just beautiful and the food and wine….ahhhh….delicious and abundant. 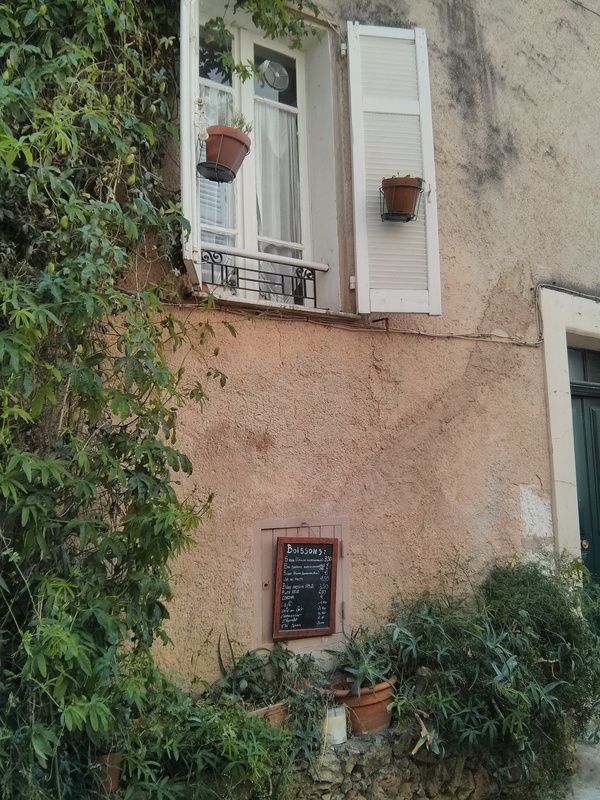 In true Provencal style we ate and ate and ate….and then ate some more. The starters were tomatoes and cheese on toothpicks with a salad of cucumber and creamy cheese similar to sour cream. Everything made with fresh herbs from Greta’s herb garden. We had garlic bread hot from the oven, bread with green olives, and another baguette. Then came the main course….I thought we had it…..forgetting the multitude of courses. We had a delicious Italian pasta covered in olive oil, basil and parmesan cheese. We then grated more parmesan over it. Next was a platter of cheeses and a salad of mixed leaves. Wine and more wine…………. and then dessert which was a beautiful platter with a variety of pastries. We were almost too full to walk home and naps were all we could manage.